Oh...look what I bought this week! 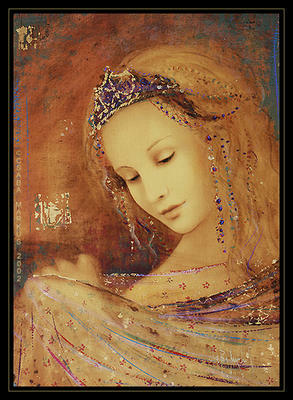 My first high priced art piece, by the amazing Csaba Markus. Last month I had heard he was coming to do a show in Vegas, and just happened to be in the Forum Shops & saw a large amount of his work in the Galleria di Sorrento. I went in & fell in love with the first one I saw "Empressa" so I bought it quickly, as there was a crazed bunch of art collectors buying up all his art pieces. I guess he is a well sought after artist, and when he does a show, he does some kindof painting mark on the art you buy and it makes it go up in value, I heard one lady say a piece she owns went up $8,000.00 after all the prints & seragraphs or whatever she was talking about...are all sold out. It was so amazing to watch these art collectors, they were acting all crazy & probably could have seen a knock down dragout between a few of them, but this is a very ritzy place, so they maintained some composure. One lady was buying this huge painting that was an original for $45,000.00! One guy was buying another for $32,000.00 with out a blink of an eye. It was quite overwhelming...but I was happy to buy my piece of art and get the heck out of there. Csaba will be here next week, so I am very nervous to meet him & sign my art in person. More nerve~racking will be, yet another frenzy to endure.... the rich, snobby ladies....Yikes, what shall I wear? I think I'll wear something unappropriate for the occasion, like my kool ripped up rhinestone jeans or my rhinestone camoflauge pants....I should get lots of snickering & whispering behind my back, mostly because... I will probably be the youngest person there. Here's his website if you want to check out some more of his art~ or check out that mustache he's sporting...he looks like he's straight out of the renassiance days! I don't know if you have met Csaba yet ( I didn't see a date on your post), but he is one of the most wonderful and amazing people you will ever meet - and don't be nervous - he's very humble and grounded. Enoy talking to him - he;s a treasure!